As another season of love, sharing and caring draws close, with matured minds and adults making plans on how best to make the moments worth a while, Millie Entertainment House has carefully designed the Valentine's Afterhour, themed, "Grind & Mingle" Valentine's Indoor Pool/Private Party, to host couples, family members and friends at Agnes Place, House 896, Ademola Adetokubo crescent, wuse 2, Abuja. 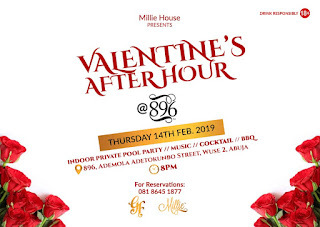 The Valentine's Afterhour event organised by Millie's Entertainment is designed present an ambience of relaxation, moments of joy and a candid expression of love for couples, lovebirds and those in relationship. The fun filled Valentine's "Grind & Mingle" party will witness events like indoor private party, music, cocktail and barbeque to make the experience quite remarkable and enjoyable. 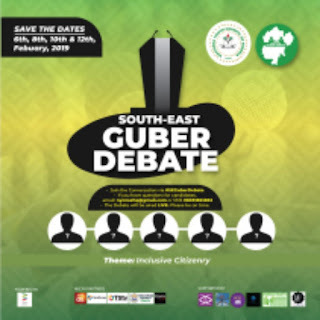 The Grind & Mingle is slated to commence at 5:00pm and will eventually give way to the Valentine's After Hour at 8:00pm on the 14th of February, 2019.